If you’re going to be an automotive engineer in Bangladesh then you should study the structure and design. You’ll be applying your study so that you can develop and manufacture cars, trucks, and cargo vehicles. Also, it requires the own specialized education and career path as the field includes separate specialties. Automotive engineering can be a lucrative career choice that requires advanced education and training far from being another step on the track of building or repairing autos. As the twenty-first-century automobiles are technological marvels, they are the refined product of more than 100 years of engineering development. Billions of people around the globe are getting safe, efficient and reliable transportation from them. In order to the continual improvement of the automobile, more than five generations of automotive engineers have dedicated their lives. If you’re an automotive engineer in Bangladesh then you can enter senior-level management positions within their companies over time. Also, you have a chance to open their own consulting engineering firms when you gain the experience and expertise. And because they already possess the technical knowledge, others take sales positions in automobile companies. After your first semester in grad school, you can seek out automotive engineering-related internships. Even, the practical experience you get during an internship is invaluable if it’s just for a few months. Moreover, you can be hired as the entry-level candidates by hiring managers. Apart from these, you can apply for automotive engineer positions with automobile manufacturers and mobility design engineering firms. Although abroad is the major hub for automotive design and engineering, there are automotive-engineering related positions in Bangladesh as well. You’ll need to select a relevant undergraduate degree when you begin your education. As there are many different fields of study, it can prepare you for a career in automotive engineering. Although you can select any other country to study graduate and postgraduate, the colleges or universities should be approved by the government of Bangladesh. So, you need a bachelor and master’s degree in order to become an automotive engineer in Bangladesh. On the other hand, the average starting salary is roughly between BDT40, 00,000 to BDT50, 00,000 a year that rises as you gain experience. And the demand for automotive engineers is growing by about 7% each year as growth-wise. You should be able to land a stable job if you have solid training and experience. This could potentially be a good career path for you if you’re interested in cars and designs and have a creative side and an interest in the technical aspects of automobiles. One of the most exciting, challenging, and rewarding careers is an automotive engineering. You’re taking with them the technical expertise of many engineers, but in particular, the automotive engineer, whenever a customer drives a new vehicle off a dealership lot. Many with master’s degrees, who are working hard to make the latest generation of automobiles even more attractive, safe and efficient, modern automotive engineers are highly educated professionals. 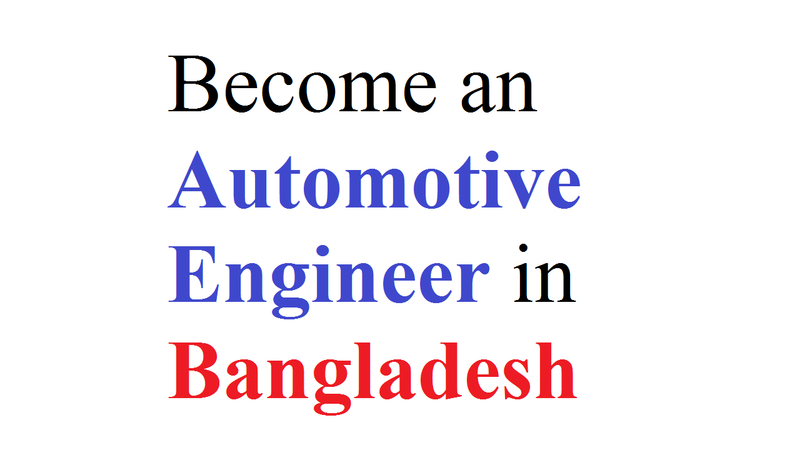 Well, let’s know how to become an automotive engineer in Bangladesh. Let alone Bangladesh, a very few universities and colleges in the USA offer bachelor’s degrees in automotive engineering. And because automotive engineering is a specialty of mechanical engineering and much of the coursework is the same, many students go into mechanical engineering. Spend time working on your resume as you begin searching for engineering jobs because a good resume is an important tool for any field. Also, your education and work experience get valued by the employers in the engineering industry. So, mention your GPA, from your undergrad and master’s programs, as well as any honor societies you were a part of including all relevant experience, training, and coursework as well any certifications you possess. As creativity and innovation are both important in the field of automotive engineering, do not be afraid to get creative with your resume. Before you can enter an engineer-in-training program and take the Professional Engineer exam you’ll have to work under the supervision of a licensed professional engineer for a number of years in most states. Look for apprenticeship opportunities as you reach your final year of college or graduate school. Also, you can talk to professors, colleagues, and connections from past jobs and internships. Based on state and your level of education, the number of years you spend working under supervision varies. Your work on the skills required becoming a professional and licensed engineer and you can get trained with an Engineer-In-Training program. One that fits your needs and career goals, find a good training program. As the training program varies by specialization, look for a program catered to your professional goals.